Lisa took me into Reno yesterday morning, dropped me at the Amtrak station, and headed home. I went into the station and they told me that Amtrak #5 was on time, and thus I was too late to check my bag. They were wrong. Unfortunately, I couldn't prove it. Not wanting to lug my bag over to the Silver Legacy and back just to get coffee (and in case they were right), I skipped coffee and settled in to wait. Lisa later reported that as she got home, #5 was passing the house, and that's about right, as we left Reno around 45 minutes late. Lisa wanted to tell me that there were some private cars on the tail of the train, but something about Skype wouldn't let her leave me a message. I could see the private cars when our train went around curves. There's no access to them from the rest of the train. (The doors don't match up, so even the people in the sleepers, behind which the varnish trailed, couldn't have gone through even if they'd been allowed to do so.) Amtrak will haul privately-owned cars that meet the railroad's mechanical standards for a set tariff. Various car owners sell space on the private cars and you get to travel in style. I've never done it, but I'd like to do so someday. When we got to Emeryville, I took a picture of the three cars as the train left the station heading for the Oakland Coach Yard. 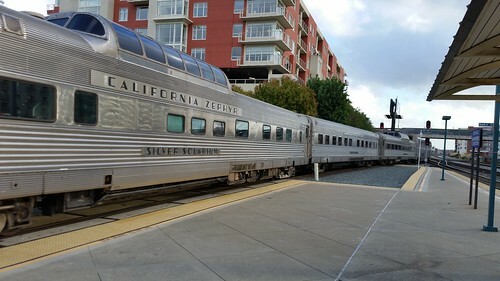 These are three former Western Pacific cars from the original California Zephyr. Don't they look nice? Being in those domes is the best way to see the superb scenery this train traverses including the Upper Colorado River canyon and the Sierra Nevada. As our train headed into the mountains, it started to rain, and rain continued fall heavily most of the trip. There was no snow at Norden on the west side of the summit, but snow was falling on Interstate 80 across the valley, and I saw bulletins of the freeway being closed due to multiple spinouts and accidents. Even after those were cleared, chain controls were in effect. Everything I saw made me really happy to have been on the train today. I've been making this trip enough times that some of the crew — in this case, the conductor and assistant conductor, plus one of the California State Railroad Museum docents — recognized me. I spent most of the trip as far as Sacramento camped out in the lower level of the lounge chatting with them, except when I went to have lunch. After Sacramento, the CSRM docents left the train, and I returned to my seat for the remainder of the trip to Emeryville. This is a lot less interesting than the Sierras, but it does have points of interest. Today's trip threatened to become more interesting that we might have wanted, however. 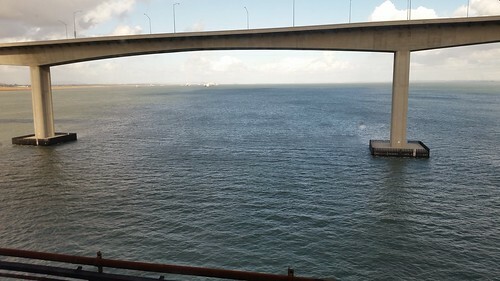 Because of the recovery time built into the schedule, we were still looking at an on-time arrival in Emeryville until we pulled up to a stop at the Suisun Bay bridge. After a while, the conductor announced that a car had hit one of the bridge abutments and we were behind held until the bridge could be inspected. After some delay, we started to pull out onto the bridge, only to halt again, followed by an announcement that "Union Pacific's corridor coordinator says we have to stop." Here's what it looked like from my seat. The bridge you see here is the newer (northbound) I-680 road bridge. In the distance you might be able to make out the "Mothball Fleet." After more delay, we were given permission to proceed at reduced speed, and our train tiptoed gingerly over the bridge and into Martinez. Delays notwithstanding, we got to Emeryville. I had no problem with my luggage, as there had been lots of room on the lower-level luggage racks when I boarded at Reno. Because of the delays, my connecting train following us down from Sacramento wasn't too far behind, and so instead of going over to the Emeryville Public Market in the rain to get dinner, I stayed in the station and waited for my train to Fremont. By the time we got to Fremont, the rain had stopped, which I appreciated because I still had about one km to walk to my mechanic's shop, where the Rolling Stonewas waiting for me. Once again, it was a mostly routine trip, and much easier than it would have been had I tried to wrestle the RV over Donner Summit. In fact, if I had been driving, I would have had to leave on Saturday to get out ahead of the weather. BTW, no costumes this Halloween. I couldn't fit anything into my luggage for this trip.